That warm and chatty penultimate kitchen post I'd planned is just not going to happen. Sorry. I've got no clever, no witty, no funny. Let's just look at pictures, shall we? The stone folks only sent two guys to do my countertop install. Now, it's a wee kitchen, so there's no room for an entire crew to work. Thing is, granite is heavy. 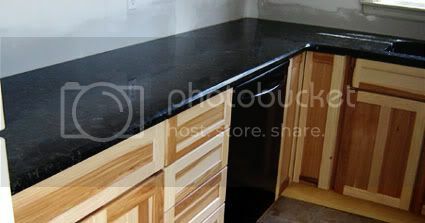 Dark coloured granite, which tends to be less porous, is very heavy. Two of our pieces were manageable, but the third (the bit that runs from the fridge all the way to the far wall and then turns to throw it's spindly granite arms around the sink) was fecking unwieldy. Somehow, the stone folk wrangled it inside. Bonus points for not dropping it on my new porcelain tile floor. 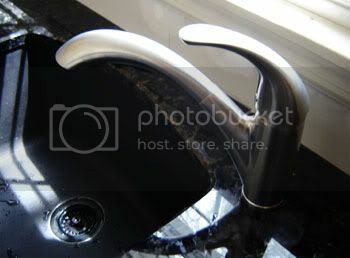 As part of our purchase, the stone folk would drill up to five holes for sink hardware/whatever the hell else we needed. We're simple people, Don and I. We just needed our faucet installed. It had to be offset. 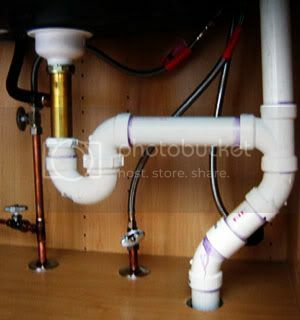 The sink we chose is D-shaped, and while it gives us a few more inches of room in the basin, it leaves no room for a behind-the-sink fixture. I'll have to get a good picture of the sink at some point. I completely adore that thing. And I'm crazy in love with the faucet fixture. I'd hug it, but that way lies unintentional soaking. Not that I speak from experience or anything. With my old cabinets, there was a panel directly in front of the sink. It sported two knobs and folded out. I'm not sure why. It was wasted space. Not so anymore. It's a sponge (and other stuff) tray! I didn't go for many bells and whistles when we chose the cabinets, but I insisted upon this. Speaking of the sink and its immediate environs... new plumbing! I didn't take pictures of the old set up, and I'm rather glad of it. Better to let the memory fade, taking with it the anguish of endless clogs and leaks and unpleasant smells. The new set up is clean and smart and rather pretty, actually. The plumber also fixed both of our outdoor faucets, disassembled the defunct outdoor shower, hooked up my stove and fitted the propane line with a shut-off. 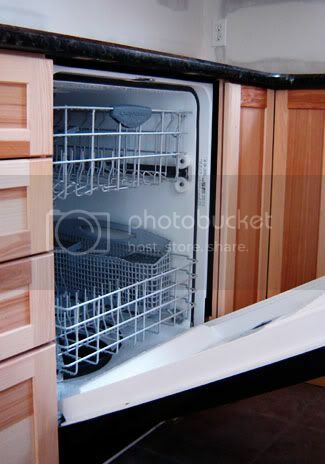 He also got my dishwasher up and running. In appreciation, my dishwasher said, "Mraaaaawr!" before closing it's maw and settling into an easy doze. One bin for garbage, one for recycling, neatly tucked away. Please tell me that someone understands how delightful this is. Anyone? Anyone? And I know this is mad blurry, but Esme never stops moving. 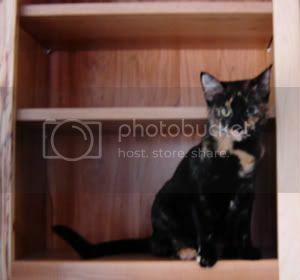 One of these days I'll have (some of) my cookbooks on these shelves, but until that day - heck, probably well after I shelve them - kitty will make herself at home. Next time in our kitchen adventure: OTR microwave! and hardware! God, that looks lovely and makes me LONG for the day when I can make a kitchen my own. We have linoleum as the countertop. Orange linoleum. It is so awful. Is there still going to be a post-kitchen party? I very very much want to come visit for a weekend and read books and pet your kitties and generally chill out and perchance watch nerdy nerdy TV with you and your husband. This is the first nice kitchen I've had in my adult life. I don't know that I've ever had anything as bad as orange linoleum (well, there was that hallway kitchen in our UES apartment; I've blocked most of that from memory). Any weekend you want to come visit will automatically be a post-kitchen party! So long as it isn't in mid-June, I think I'm pretty open. Don will be involved with the pewter booth at Faire, so it'll mostly be you, me and the kitties. Oh, and geek tv and books and the farmer's market. And playing in the kitchen. You could never be old and dull, my darling. Loverly! And i think a post-kitchen party would be great... I would even bring food cooked in my non-loverly kitchen..! and Great job with all your selections!!! I totally get the easy access bins!! 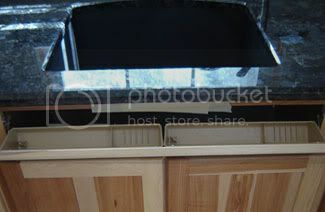 When my Dad rebuilt the lone counter in our family cabin I suggested the shelves be built as pull outs. Can I tell you how much love they get from the rest of the family? If only they knew I thought of it. No more cricks in backs from trying to get the pots in the back! SO YAY FOR THE BINS!!!!!!!!! So jealous! It looks absolutely lovely! I want a cookbook shelf. 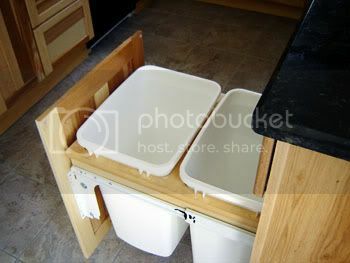 And hideaway bins for recycling and trash. And a secret sponge compartment! And a shiny sink and a new dishwasher and a kitchen of my own! Are you going to have a little kitchen herb garden somewhere? Or is all of that stuff outside? I need to see your kitchen in person, so I can make squeeing noises. But then you would have to leave the room so you don't see me lean down to rub my cheek, gratefully, like a cat, on your countertop. I still don't believe it (or the rest of your house) exists. Big happies for you and Snuffalupa-kitchen anyway! So beautiful and you absolutely deserve it. My aunt's got that same garbage/recycling cabinet set-up, and I've always been jealous. There is no way for cats to get in and tip over the trash! 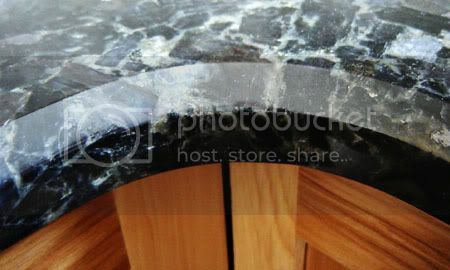 And wow, that countertop is so gorgeous and shiny. It's a beautiful kitchen. Some day you must let me know the details. I'm trying to get mom to do something about our kitchen. I almost got her to talk to a rep at Home Depot today.